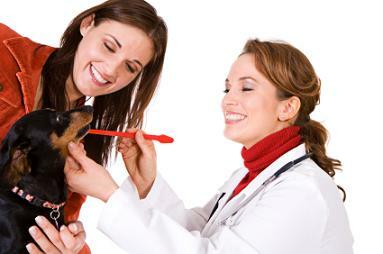 Brushing a dog's teeth is the most effective way to controll plaque. When you're buying a toothbrush for your dog check for soft bristles and toothpaste designed just for dogs. Don't use human toothpaste for dogs as it can upset your dog's stomach. When brushing your dog's teeth, start by using your finger and then introducing the toothbrush once your dog is comfortable with you massaging her gums with your finger. Stop brushing immediately if your dog resists and try again later. Like any training procedure for dogs, toothbrushing requires time and patience. After successfully brushing your dog's teeth, reward them with a favorite (non food) treat such as a game or walk and of course, lots of praise. If all else fails consult your vet for dog toothbrushing advice.